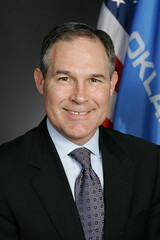 Is Pruitt Deal Good For Oklahoma? It’s difficult to discern what Oklahoma Attorney General Scott Pruitt gained politically by opting out of a massive national bank settlement dealing with the mortgage crisis and striking his own deal for the state. Obviously, some people, including the writer of this New York Observer article, are questioning whether Pruitt sold out Oklahomans to curry favor with the banking, insurance and real estate industries, which were heavy contributors to his 2010 campaign. The $25 billion settlement between five major mortgage providers–Bank of America, JPMorgan Chase, Wells Fargo, Citigroup and Ally Financial-and 49 out of 50 of the nation’s state attorney generals was announced this week. Pruitt, a Republican and the lone holdout, made his own deal for $18.6 million to help homeowners here who might have been subjected to unscrupulous lending practices. The Observer notes one of Pruitt’s arguments against the settlement was “that what started as an effort to correct specific practices harmful to consumers, morphed into an attempt by President Obama to establish an overarching regulatory scheme, which Congress had previously rejected, to fundamentally restructure the mortgage industry in the United States.” Another argument Pruitt has made, according to the article, is that the settlement was unfair to homeowners who continued to make mortgage payments during the housing crisis despite a decline in property value. Note the criticism of Obama. Also, Pruitt hasn’t yet presented any evidence that there’s a groundswell of opposition here to the settlement from homeowners who believe they’re being treated unfairly. So, again, it’s difficult to see what Pruitt gains politically here. The financial, insurance and real estate industries donated about $175,000 to his 2010 campaign, according to The Observer article, but is that what really motivated him? If we view it as a principled stance, how much should Pruitt’s conservative ideology and his concerns with the current presidential administration influence his decision process as attorney general? Shouldn’t Pruitt put Oklahomans above ideology in this case and get as much financial relief as possible for those people hurt by the mortgage crisis? Does Pruitt’s decision open up the state to possible class-action litigation?